From 2017 to 2018 Rosemary Miller and I were on a quest to find the ultimate Manhattan. Our search was prompted by the wide variation in quality of Manhattans we had been served. For a simple cocktail, it’s not always easy to get it right. We learned that some vermouths go better with certain whiskeys than they do with others, and each ingredient in the cocktail build has a bearing on the final cocktail. One of the oft-overlooked aspects of a great Manhattan is the cocktail cherry. Plenty of places use plain ole maraschino cherries, and I’ve even been served a Manhattan with a maraschino cherry at an esteemed whiskey bar before. There are so many better options out there, and while Luxardo is the gold standard there are lots of other options available that are easily just as good. Sometimes at home I just use Morello cherries, but they are very tart and tend to be on the mushy side. In our study we liked Jack Rudy Cocktail Co cherries as well as Bourbon Barrel Foods’ Woodford Reserve Cherries. 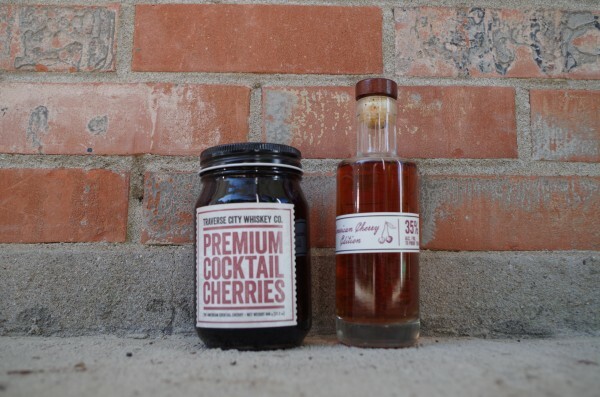 We didn’t try every cherry known to humanity, but we tried several and narrowed it down to four of our favorites, both of which we can either order online or which are carried at Louisville retailers. I cracked open the jar alongside some of the other jars I had on hand – Luxardo, Morello, and maraschino. The Traverse City cherries were far superior to the Morellos and the maraschinos and on par with the Luxardos. They were firm and chewy, sweet but not too sweet, and had a distinctly different flavor profile from Luxardos. I will be more than happy to use these cherries in my next Manhattan cocktail.